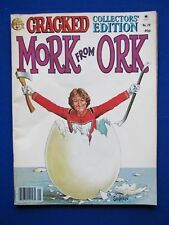 Here we have the magazine ' Cracked - Collectors edition: Mork from Ork. This issue of the magazine is the 29th issue. It is impossible to be an expert in all realms of collecting, and I am honestly representing the item(s) to the best of my knowledge and ability. 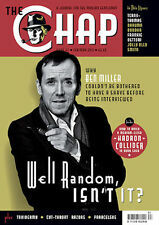 The Chap Magazine. Issue 67 of The Chap examines the boffins and gadgets of the world of science Plus: Tailors v Designers; Chappish Dispatches; Viv the Spiv’s Joke Corner; Am I Chap?. Mr. Bell the Butler dishes out sound advice on hip flasks, cycling etiquette and country boots. This issue of the magazine is the 14th Annual issue. Fall 1979. 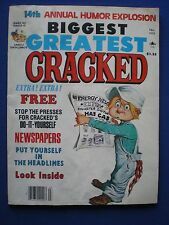 Here we have the magazine ' Cracked '. The Chap Magazine. We can help! Khaki Trousers\the Art of Conversation. Plus all the usual gubbins. Competition results. Peaky Blinders. Olly Smith Interview. Contents include. The Chap Magazine. Chap Kit: the Gentleman’s Notebook. Plus: Queen of Chapettes, Am I Chap from Goodwood Revival, Notebook competition. We can help! A History of Politics in 50 Objects: the first three: Primrose League Badges, Top Hats and Party Colours. Readers stories. Coping with a blind rabbits. G I Stasis. Diff'rent Strokes. Super Special issue number 48 of MAD magazine. Spy Vs. Spy. Used but in excellent condition. Trapper John, M.D. Super Special issue number 51 of MAD magazine. Spy Vs. Spy. Used but in excellent condition.